"The belonging you seek is not behind you. It is ahead." Order your own copy of Knights of Fate at your local retailer or online through our website today! The galaxy is in chaos. The Jedi Order that once defended the innocent against the forces of darkness has been destroyed, and fear has taken hold beneath the iron fist of the Empire. Now, who will take of the mantle of the guardian and restore hope to a sorrowful galaxy? The time has come to take a stand and widen your view of the galaxy with new specializations, species, as well as weapons and gear, vehicles, starships, and ideas for countless new adventures. 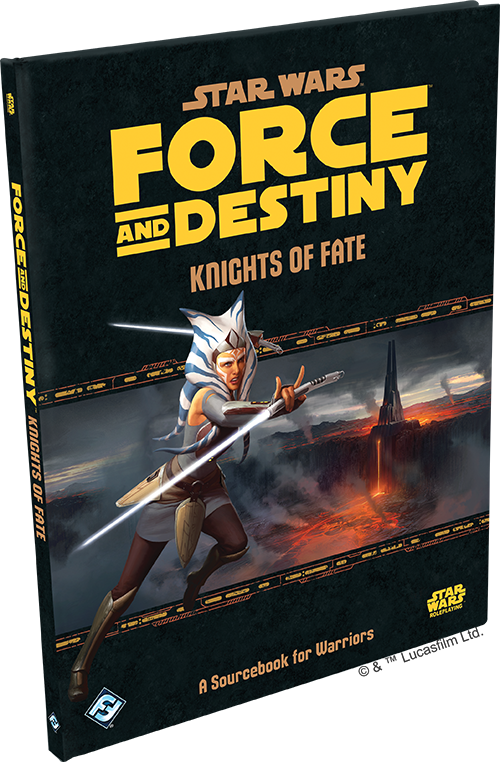 Knights of Fate, the Warrior sourcebook for Force and Destiny is on sale now at your local retailer or online through our website! Knights of Fate introduces three new career specializations, allowing you to hone your skills and discover what the Warrior class means to you. Are you a protector of the meek or a vicious brawler? A trained martial artist or a raging berserker? With the dissolution of the Jedi Order, there is no single correct path: the answer lies solely within you. The Juyo Berserker is a master of the seventh style of lightsaber combat, which was often forbidden among members of the Jedi Order. Harnessing their natural rage, the Berserker must consciously balance the light and dark influences of the Force within themselves as they channel their negative emotions into positive outcomes. The Steel Hand Adept is a master of unarmed combat. 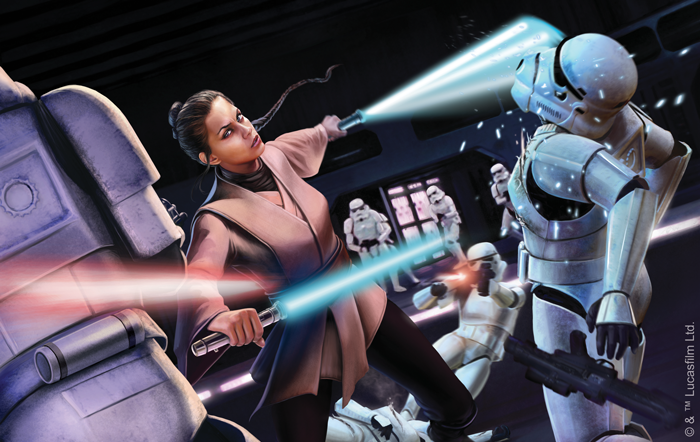 Rather than relying on the use of a blaster or a lightsaber, these martial artists draw on the power of the Force and wield it as a weapon to break through heavy armor and extend their reach far beyond the length of their arm. With grace and speed, they effortlessly dodge their opponents’ blows and fight just as effectively as their armed counterparts. The Colossus is powerful and untiring, relying on stamina and endurance to outlast their foes in battle. They prioritize mental fortitude over physical strength, knowing that pain is only temporary while the experience gained through battle will last far longer. They commonly reflect the stoic nature of the Jedi and maintain a mental calm in all situations, whether they favor blasters, lightsabers, or unarmed combat. With patience and mental control, they will channel any pain they receive into damage dealt, with a potency and precision unlike any other class in the galaxy. In addition to these three new specializations, Knights of Fate also brings three new species to Force and Destiny. While Warriors can hail from any species, these new additions are natural fits for the Warrior career—adding variety and complexity to the stories told in your campaigns and offering you the chance to see the galaxy from an entirely new point of view. The Dowutin are brash, arrogant, and powerful, lending themselves easily to the Colossus or Steel Hand Adept specializations. Though physically strong, when these people are separated from their home world, they tend to become introverted, leading solitary lives and seldom seeking companionship. Mikkians come from a culture which connects combat and spirituality, preparing them for the study of the Force and its uses in battle. Known for their loyalty and sense of honor, these people have the potential to become invaluable allies in your campaigns. But you must never ask them to lie—their integrity is of the highest value and their code of honor applies to all things. The Phydolon are new to the galactic stage, as their world was only recently discovered. Deeply spiritual, these people loathe to leave the collective of their home planet, but with the galaxy opened before them it may be time to find something larger than themselves in the Force. Regardless of which species you choose to embody and which specialization you may be drawn to, you should not let it deter you from the path of the Warrior. Master Yoda’s diminutive stature often led opponents to underestimate his prowess, but these assumptions always led to their demise. As your characters evolve, you are sure to find new depths, and with the advice included in Knights of Fate for running a game that's rewarding to Warriors, you'll be certain to find adventure between the stars like never before. The incredible expanse of space stands before you, and the time has come for you to discover your place in it. With new tools to explore the galaxy like never before, the path to find your destiny has never been clearer. Pick up your lightsaber and step into the shoes of the fearless Warrior! Pick up your copy of Knights of Fate (SWF46) at your local retailer today or on the Fantasy Flight Games website here!